Lovest thou Me? – John 21:17. He said to him the third time: “Simon, son of Jonas, lovest thou Me?” Peter was grieved because He said to him the third time: “Lovest thou Me?” And he said unto Him: “Lord, Thou knowest all things; Thou knowest that I love Thee.” Jesus said to him: “Feed my sheep” (John 21:15-17). 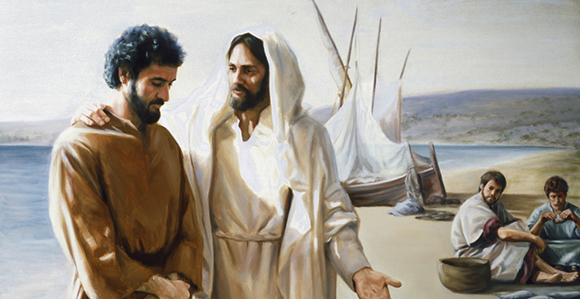 So mercifully did the Lord remind Peter of his former haughtiness and contempt of the other disciples, as well as of his subsequent threefold denial, and at once reinstated him in his apostolic office. Though we have often fallen so far short in our Christian life and confession, yet Jesus receives us again and again, and is gracious, merciful, gentle, and kind toward us, and permits us to continue to be His own people. Therefore, “We love Him because He first loved us” (I John 4:19). And He knows that we love him. Love for Jesus will show itself in service to Him, as well as love and service to others, especially toward those who are with us in “the household of faith” (Galatians 6:10). The Apostle John gives us this needed reminder: “Beloved, if God so loved us, we ought also to love one another” (I John 4:11). The pattern for such Christian love toward others is set forth by our Savior in John 13: “Love one another as I have loved you” (v. 34b). PRAYER – Lord Jesus, I love Thee. Thou knowest all things; Thou knowest that I love Thee. Because of all that Thou hast done for me to satisfy God’s demands of me (and of all other sinners) in His holy Law and all that Thou hast done in paying to God the huge debt for my sins (and the sins of the whole world), I want to glorify, honor, worship, and thank Thee more and more with my body and my soul by more willing and cheerful submission to Thy Word of truth and grace, relying more and more on Thy sure and changeless promises Help me each day with these desires of my heart. Amen. I thank Thee that my soul is healed by what Thy lips revealed. fill all my nature with Thy light, O Radiance strong and bright. grant that my every thought may be, directed e’er to Thee.